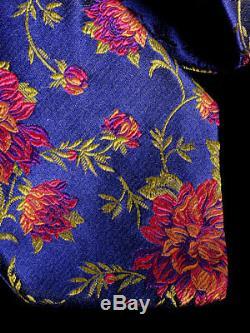 It has a stunning and unique floral design woven along the length of the tie in signature Duchamp London style against a blue background. 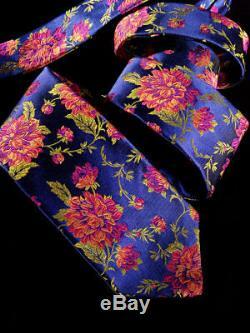 The tie is brand new and made by hand in England at Vanners silk mill - it is 3.5 inches wide and 58 inches long and looks awesome. It comes with its Duchamp London tag D2323210S/126. Duchamp London ties are hand cut and sewn in England and Italy using the finest jacquard silks from Europe's oldest silk weavers. They feature a one piece lining which helps to form the perfect knot, while also ensuring that the tie also retains its shape and volume. 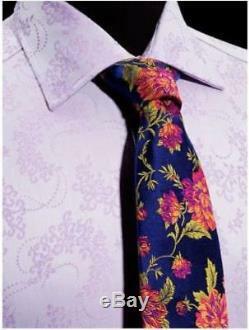 The blade is 3.5 inches in width - this is a special necktie - you make a statement by wearing this wonderful tie! Feel free to ask any questions. The item "DUCHAMP LONDON, HANDMADE STUNNING BLUE & MULTICOLOR'ROSACE' TIE, FREEPOST" is in sale since Tuesday, June 5, 2018. This item is in the category "Clothing, Shoes, Accessories\Men's Accessories\Ties". The seller is "multicolourties" and is located in Melbourne, World's Most Liveable City. This item can be shipped worldwide.